The Loons are in trouble in Minnesota and Wisconsin. We are now thought to be as low as 700 nesting pairs in the two states. The Loon is moving North to Canada. 1). The rising Eagle population that takes the chicks. 2). Fluctuating lake levels, that leave the nests away from the water. 3). Raccoons taking the eggs on the shore line. 4). Boat traffic in nesting areas, especially big wakes that swamp the nest and can cause loss of eggs. Also when the Loons get scared they can become “flusher Loons” and flush their eggs. 5). The cold windy Springs we have had of late. The conditions are brutal on the newly hatched chicks, that in natural nest are pitched by their mother straight into the water, never to return to the nest. On Benedict Lake we are down to two nesting pairs. Last year one chick was produced but did not survive. The year before there were no chicks. So, I was informed of this fact as my neighbors as they left for Florida in the fall. They left giving me orders to fix it! I was steered to the Mantrap Lake program by Ms Perry at the DNR office Brainerd, who informed me they would be of more assistance then the DNR. Seems like another program that needs less money! On Benedict Lake, the problems have been exacerbated by the American Army Corp of Engineers operation of the Federal Dam. Now there is a government agency that goes around spreading harm far and wide. That is definitely an organization that needs legislating into oblivion. Please see the page on this blog on Red River Flooding. The problem has occurred since the Corps lost their lawsuit filed by the State of ND over their operation of Lake Sakakawea. The Corps can no longer empty Lake Sakakawea into the Missouri river to float barges on the Mississippi, so they are taking water from lakes like ours that drain to the Mississippi watershed. So at Ice off the lakes are high. Then as soon as the flood run off is gone, the Corps drop the Lake levels by opening the dams. The loons nest the day of ice off on the shore line. The Loons can not get around on land and have to abandon their nest. This also causes increased predation by Raccoons. The Eagle population has increased drastically and they love the chicks. On Benedict Lake the Loons like to nest at the entry to the Benedict River. Unfortunately far too many fishermen and boaters, do not obey the closed throttle rule on the river, swamping nests and scaring Loons. So the Mantrap Lake Association has been studying the Loon and assisting breeding with a rafting program. They have identified 19 nesting areas, and have increased the population of Loons to 19 pairs. 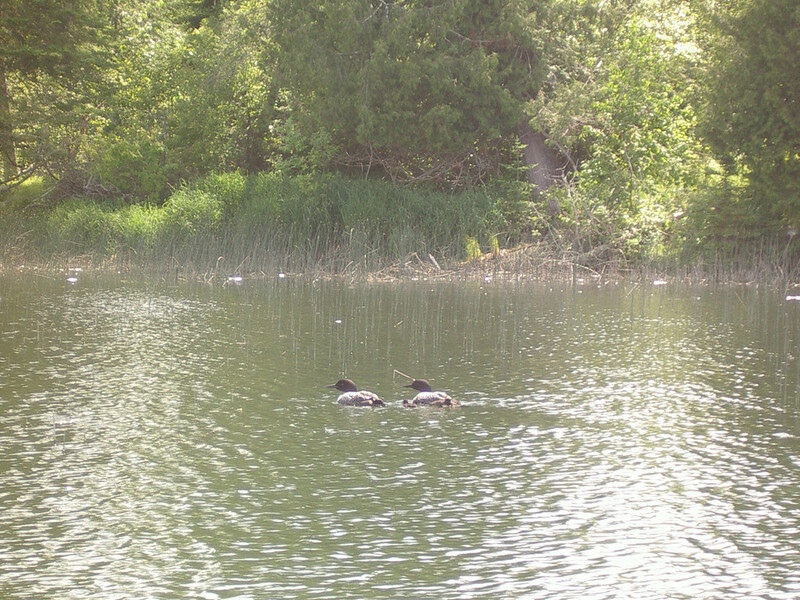 Loons return to the same Lake. A lake that looses its Loons is far more lilely than ot to stay silent. Yesterday with Don, a local Artisan we constructed the latest version of the Mantrap Raft, but modified, by allowing the canopy to hinge to allow this portly old chap to easily built the nest. 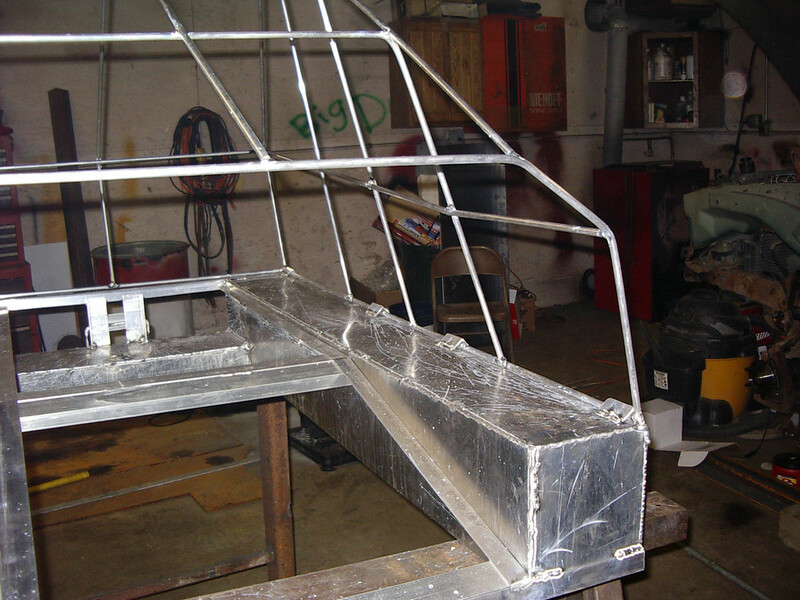 Here is a late model Mantrap Raft. Now you have to deploy the raft the day the ice goes out. Now for obvious reasons it usually goes off on a windy day, so boat control is a significant problem. We will try and encourage nesting away from the river. There is a relatively sheltered area when Loons have historically nested, so we will deploy our first raft 15 ft off shore from this location. We can only put the canopy 12″ up until we have our first successful nesting. The rafts are deigned to accomplish the following. 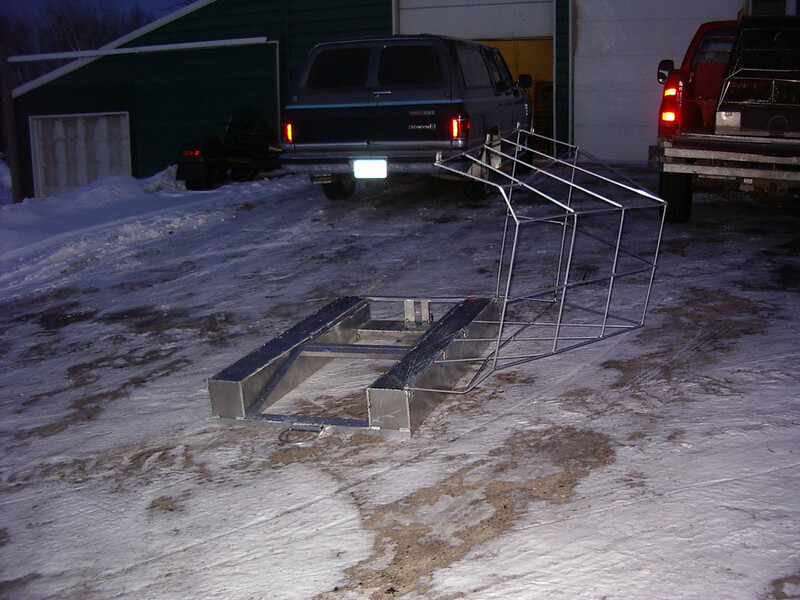 Provide a stable nesting area for the nesting pair that is unlikely to be swamped. The nesting ring prevents eggs rolling into the water. 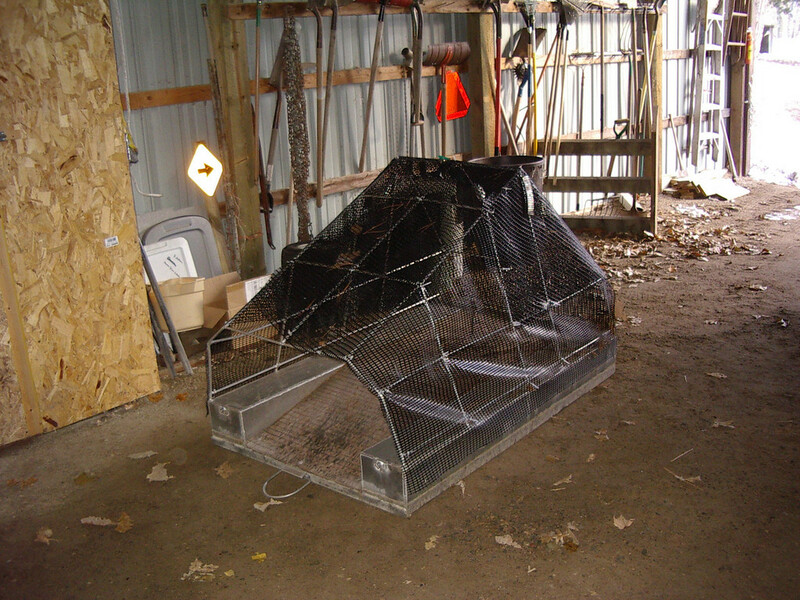 The canopy prevents predation of chicks by Eagles. The chicks never return to a natural nest but these rafts they do, and have been observed to use the rafts for 3 to 5 weeks following nesting. The ramp is crucial here. The black canopy provides shelter and heat, as the sun heats the black structure. Chick survival is much improved. Once the Loons accept the rafts, they expect them to be there each year, and follow their raft to safe anchor, and hop right in as the boat pulls away. 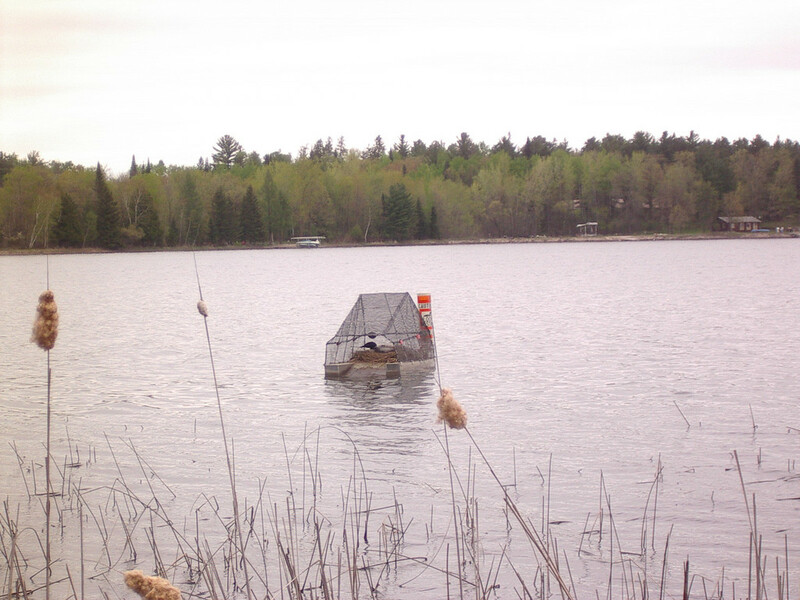 Loons have been known to fight to the death over rafts so once acceptance is achieved it is desirable to have enough rafts for the nesting pairs of the lake that use them. It can take 3 to 4 years to get the Loons to accept the rafts. There is some push back from Fishermen who feel deprived of these nesting areas in breeding season. The rafts and the deployment are licensed by the County Sheriff. When legally marked with official marker buoys fishermen can not approach the nesting area without risking severe penalties. So we will see how this endeavor progresses this year. This nesting program has been successful. The raft has now been deployed for 4 years at ice out. The first year the placement was less than ideal. The next year the raft was deployed close to successful nesting area where one chick hatched and survived. The next year the raft was deployed in the same place. The loons built a natural nest that was predated right away. No chicks resulted from that pair. The next year 2012 the loons used the raft and two healthy chicks hatched which survived. This year 2013 the loons again used the raft and two healthy chicks hatched which are doing well at just over 5 weeks of age. It has surprised me how well wild animals take to a device like this. However they seem content and safe in these rafts and do not stay head down most of the time. They sit up surveying the scene like lord and lady of the castle.